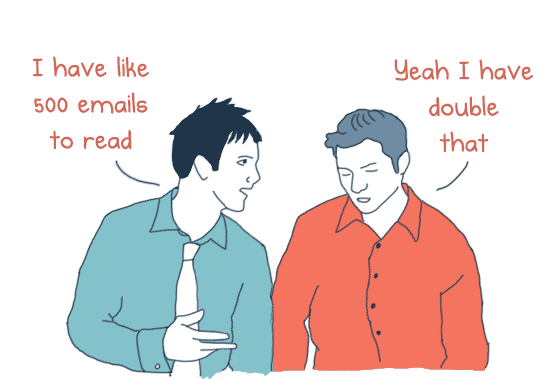 Millennials are a humanoid form presently perplexing the professional world. Never before has such an incomprehensible and downright mysterious breed had the propensity to darken hiring mangers’ moods the world over. Oddly, literally no one is writing about Millennials. So in the absence of any articles anywhere discussing these creatures and their deeply idiosyncratic traits, here are some basic tips on how to work with the Millennial. Good luck and Godspeed. Millennials cannot be found on the street or hanging out with their friends, nor can you find them pounding the pavement to deliver their resumes to you… So how do you hire them? You need to go to where they are: you can find them in the Snapchat, the Tinder, or the Instagram, where many of them will comfortably Twitter away entire days. Favorite a Millennial’s tweet on how Bodak Yellow is a banger, and you have a real chance of hiring them. Do not try to understand what any of this means. In short, the Millennial will prefer to work for people who share their values and interests, so do your research. Studies show that the Millennial species wants to be involved in high impact work and make a difference, and that experiences are way more important than things. So ask a Millennial to do the hardest, most stressful work then give them a yearly subscription to a rock climbing gym. They will brag about it to their friends as if you’ve given them actual gold. For that matter, praise Beyonce all day. Don’t hold back either: suggest she should be the world’s president or queen. You’ll get unanimous agreement, no matter how unfounded your statements are. Rihanna can work here too, but avoid Drake. Avoid any attempt at humor. Not enough studies have been done to understand how humor operates in the Millennial culture, and chances are if you don’t say it with a meme, it won’t land. Don’t take that chance. Preface all your sentence fragments with the utterance “hashtag.” As in, “hashtag drama,” or “hashtag STFU.” Do not try to understand. Hashtag it’s complicated. In the Millennial culture, these are sacred gifts that will endear you to them eternally. Also a Millennial will need constant positive feedback on their work (in Millennial language, this is called simply “feedback). Keep in mind that millennials grew up in a world where it was implied to them that everyone was equally deserving of respect. In the Millennial religion, the “microaggression” is the ultimate transgression of this laughable yet pervasive dogma. Avoid talking about it when you can, and when a Millennial brings it up, simply nod gravely and say it’s a serious issue. Do not take any steps to understand, just know that this is the way of the world. Reverse mentoring is exactly like regular mentoring, except that you add the “reverse” to remind the Millennials of their place. See, in olden times it was the more experienced people who mentored the young, and even though no one wants to hear your irrelevant tips for how to operate in a world you no longer understand, calling it “reverse mentoring” will allow you to keep some semblance of dignity. 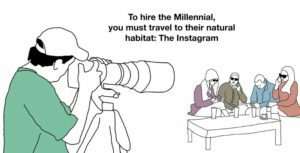 Appeasing these Millennial creatures is a necessary struggle, for they hold the keys to unravelling the Great Mystery of Social Media Marketing and pretty much all other enigmas of the Modern World.